Hello all! Sorry for the MIA status lately. I suppose my demanding schedule got the best of me, so let’s jump right back into what’s been going on in Korea. 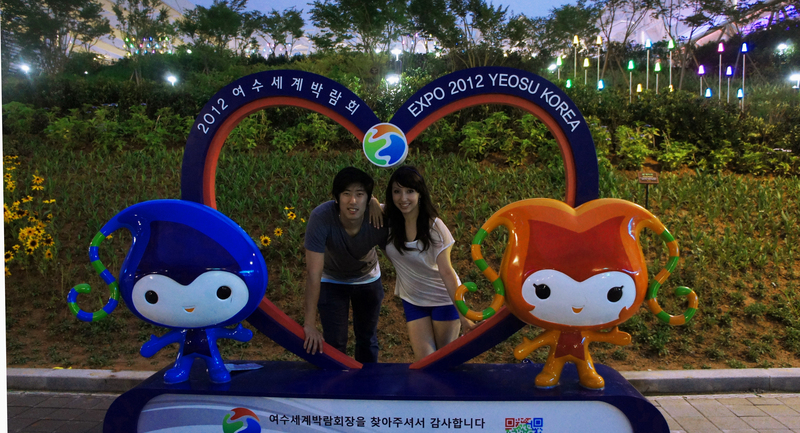 A few weeks ago my boyfriend and I finally made our way to Expo 2012 in Yeosu (after a month of rearranging schedules). It felt like a nice escape to have the chance to enjoy other cultures without leaving the country. For those of you unfamiliar with this expo, here’s a bit of history. 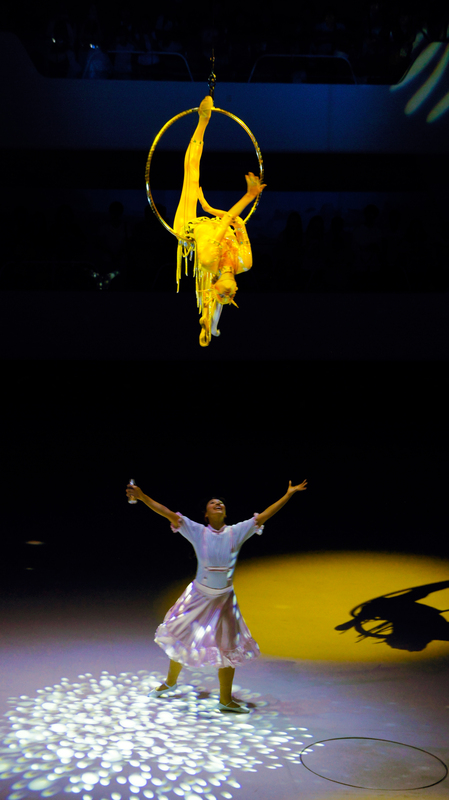 The world fair occurs every few years or so and is always hosted by a different country. Lucky for me, this year it is held in Yeosu, South Korea. It is about 3 hours outside of Seoul by KTX, which very conveniently drops you off right at the expos doors. In a lot of ways it’s a once in a lifetime opportunity, seeing how the last one held in the U.S was back in 1984 in New Orleans. The exhibition offers something for everyone. Visitors can experience different cultures, scientific advancements and new inventions, while exhibitors can showcase their ideals, aspirations and contributions to the world and its future. Keeping that in mind, each expo has a different theme each year. This year’s theme is “The Living Ocean and Coast.” So, participants focused on ways to preserve and sustain the oceans, for our own well-being as well as that of our marine life. 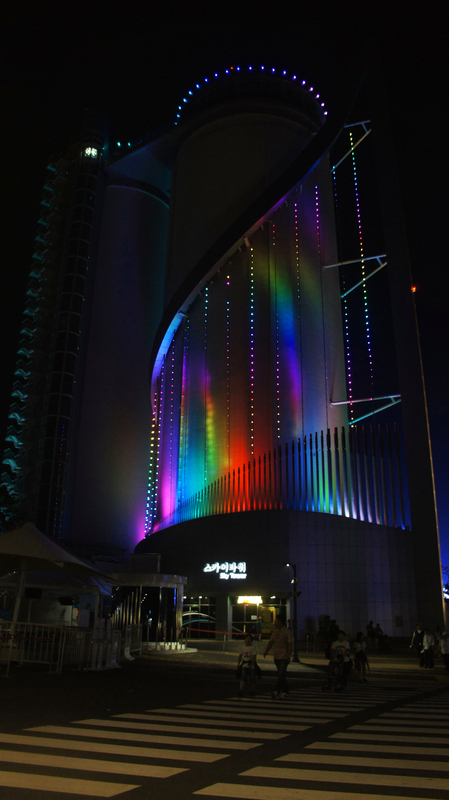 When you go to the Participant Pavilions I can definitely say that inspiration through entertainment was a popular choice, as many larger companies such as Samsung, Lotte and LG provided live performances and 3D experiences. My favorite show was ‘The Big Man Show,’ held in the POSCO Pavilion. The show is a beautiful combination of vibrant colors and oceanic projections with a lovely symphony of instruments and sounds of nature. It’s shown in a 360 degree room, so you really feel emerged. In the end “The Big Man” explodes from the darkness and frightens a lot of people (unintentionally). After that he dances till the end of the show. It’s actually really entertaining to watch a man in a huge blown up costume get down. I mean, the guy was just SO into it. I loved it, but that may just be my view as a dancer. Be warned, because of the shows and long lines to get in, these pavilions can take up a huge chunk of your time. If you only plan to go for a day, like I did, there is no way you can see everything so I suggest you visit these in the morning and choose maybe 3 or 4 to go to. The International Pavilion is filled with exhibits from over 50 different countries. This is definitely where you would want to spend most of your time. 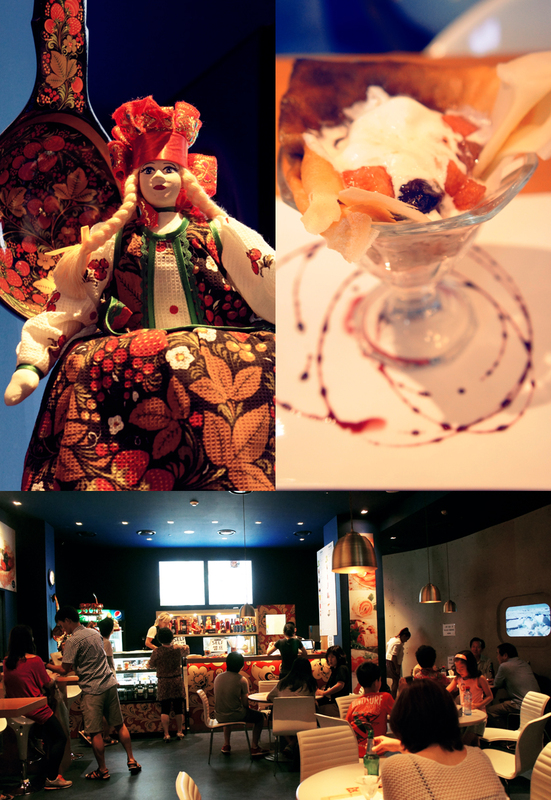 There are various performances held throughout the day, souvenir stores to shop at and my favorite… ethnic restaurants. In fact, my boyfriend and I made it our personal goal to try as many different foods as possible. Let’s talk about that. We tried Papas Rellenas (fried potato stuffed with beef and spices) and a piece of Tres Leches cake from Peru, Kangaroo special galbi jjim (갈비찜) from Australia, Pancake a la flambé from Russia, and Kransekage from Denmark (soft chewy almond cookie dipped in chocolate). I didn’t realize the Kangaroo Special was actual kangaroo until half way throughout the meal. I felt really sad in that “kangaroos are friends not food” kind of way, but unfortunately it was delicious. We ended our night with a lovely dinner at Spain’s Tapas Bar. 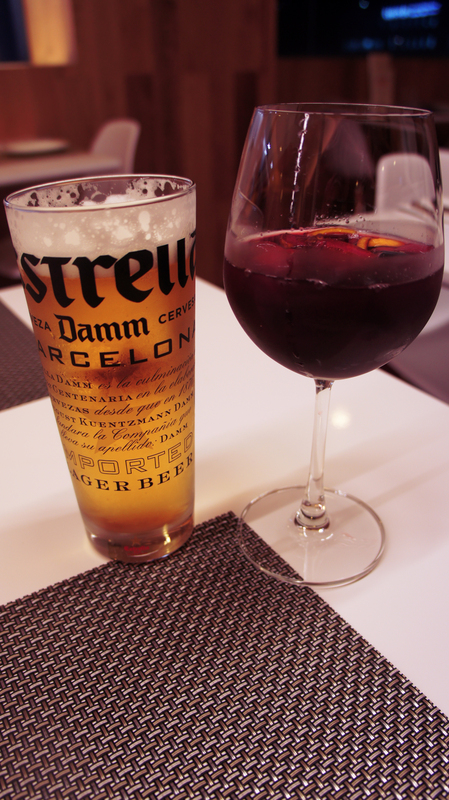 My boyfriend had a Spanish beer while I indulged in an excellent glass of sangria. Although I can’t recall the the names of the dishes we ate, I can tell you they were amazing. One dish was quail egg wrapped in salmon served on bruschetta. The other was lamb served on bruschetta garnished in caramelized onions. Although the portions were incredibly small, the taste was unforgettable; Unique blends of sauces and spice. Needless to say we were incredibly full by the end of the day. It was a really fun and wonderful experience, despite the terribly worn feet at the end and the bad weather. There was honestly so much to see and do, I wish I could have stayed an extra day. There is no way to get to everything in just one day. Nonetheless, I certainly saw (and ate) a lot. So, if you’re in Korea, it’s definitely something you should experience first hand. The Expo will continue until August 12th. For more information, you can also check out their website HERE. Until next time, happy travels! 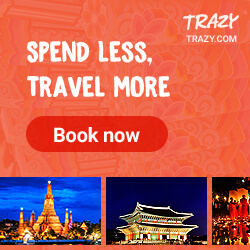 Tags: Culture, Korea, Photography, Seoul, South Korea, things to do in Korea, tourist attractions in Korea, travel, travelling in Korea, World Expo 2012, Yeosu Expo 2012. Bookmark the permalink.